Challenge yourself physically and mentally as you climb real rock cliffs with Denver Climbing Company. Your professional mountain guide will provide all the equipment an teach you the fundamentals of this amazing sport. This is a great activity for any group size and all ages. Explore the Colorado mountains in a way you never thought possible. Your day begins by meeting your climbing guide at the designated location just outside of Denver. You will be provided all the required equipment including climbing shoes, harnesses, and helmets. After a safety briefing, it’s off to the cliff! Your professional climbing guides will provide instruction on all the skills of top-rope rock climbing. 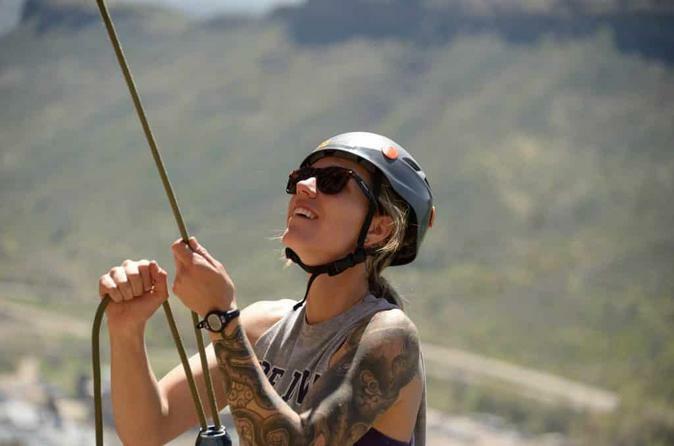 These techniques include belaying, knot tying, safety, and climbing technique. After learning your new skills, the majority of the time will be spent climbing real outdoor rock. This is the perfect activity for anyone seeking a uniquely Colorado experience. No experience is required and it's great for all ages. 9:00am - Client pickup if option is selected. We will contact you for the address. 10:00am - Meet at the designated climbing area. ( 20 minutes from downtown Denver. We have a shuttle bus available). 10:30am - Hike to our climbing location from the parking lot. 11:00am - Guides provide instruction on the fundamentals of climbing. 11:30am - Start climbing using your new skills.